FTD® proudly presents the Pick-Me-Up Rainbow Skies Mini Rose Plant. Set their sights to the skies with this stunning miniature rose plant! Perfectly sweet pink blooms blossom amongst lush green foliage to create a stunning gift. 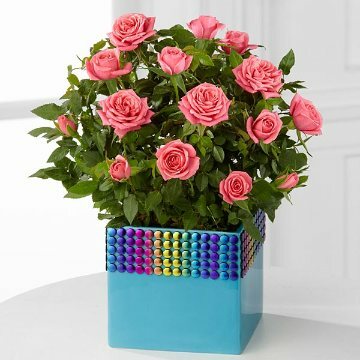 Presented in a blue ceramic container accented with metallic beaded rainbow inspired band at the top, this beautiful blooming plant will have their spirits soaring in celebration of a birthday or anniversary, or as a get well or thank you gift.